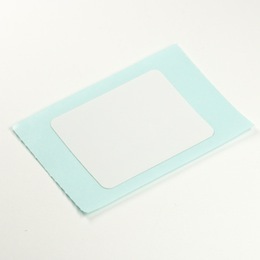 A sticker in which IC chip and antenna is embeded. This communicates with FeliCa reader/writer wirelessly. It is 0.385 mm thick like a paper and has adhesiveness to be put on various surfaces. Note: FeliCa Lite is a minimized contactless smartcard product with an optimized file system and streamlined security functions. so that it can be used for various form factors in addition to the card, such as stickers.